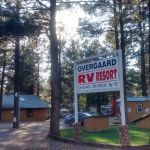 Ask fellow campers about "Overgaard RV Resort" and nearby attractions. This is an old park with mostly permanent park models and old rvs. The pull through site only works if you do not want to connect to water and sewer and can get by with 30 amp service. There are only two rest room/showers but each is a full bathroom. The facilities are about 40 years old and need upgrading. We will look elsewhere. If we need to stay in the area again. 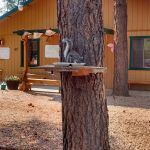 We camped at Overgaard RV Resort in a Motorhome. There is not much in this area. The Red Onion was very good for lunch. Thank you for taking the time to review our park. We apologize for your trouble with the hook-ups in the pull through site that we reserved for you but we have people in that spot all of the time who hook up without problems and in fact had someone who stayed in that spot for a couple of years with no trouble. We also offered you the use of a converter so that we could provide you with 50 amp service and you would not have had to get by with 30. We do everything we can to make sure that all of our guests needs are met and we were able to move you to a spot that did have 50 amp hook-ups. As for the age of the park and it needing upgrading, have made and are making consistent improvements and are upgrading the park's amenities and grounds but it can't all be done at once. The benefit to the park being older is that we have amazing shade trees which is just one of the reasons why we have so many people who want to be here year round! Thank you for staying with us and for your feedback. Are you affiliated with Overgaard RV Resort ?